I’ve eaten eggs from the grocery store my entire life. I’m sure at some point in my childhood I’ve tasted an egg fresh from the chicken coop because my Grandpa raised chickens, but that was before my palate was experienced enough to appreciate the difference. It’s true that when you’ve never experienced better, you don’t know what you’re missing. So, when my good lookin’ boyfriend showed up at my door last week with one dozen, light brown and cream-colored farm eggs in one hand and a beautiful bouquet of flowers in the other (I know…keeper), I set my sights on cooking the eggs just the way a farmer recommended: in a little bacon grease with salt and pepper. I’ve never tasted anything like these eggs…it was pure eggstacy (had to do it!). Seriously, the flavor is out of this world, and sure to make you crack a smile (okay, okay). During cooking I found them to be more fluffy than a store-bought egg. Produced by free-range chickens, farm eggs are more nutritious because the chickens are able to roam freely and eat a natural diet. They contain no added hormones or fillers and are not processed. One meal that exemplifies comfort food for me and really lets the farm egg shine, is the tried and true bacon, egg and cheese sandwich. A fancy meal has its time and place, but it’s not always the five-star, fine dining plates that trip my trigger. Sometimes, a good ol’ familiar meal is the only thing I need to feel centered, satisfied and one with my kitchen again. 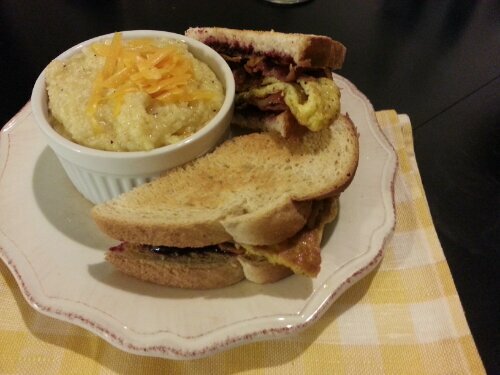 Served with a side of cheese grits, breakfast for dinner has never been better. Blackberry Jelly (I used homemade jelly from the Amish country that I got from a quaint market, but Smucker’s works great if you don’t have that). Cook three strips of bacon in a skillet on medium heat until just crispy (I like mine slightly underdone). Remove from the pan and drain on paper towels. Pour off some of the grease, reserving enough to cook the eggs, about 1-2 tablespoons. Whisk the eggs together in a small bowl, season with salt & pepper. Pour the eggs into the pan and let set. Cook for about 2 -3 minutes on each side, flipping once for even browning. Meanwhile, slice or grate the cheddar cheese and toast two slices of bread. 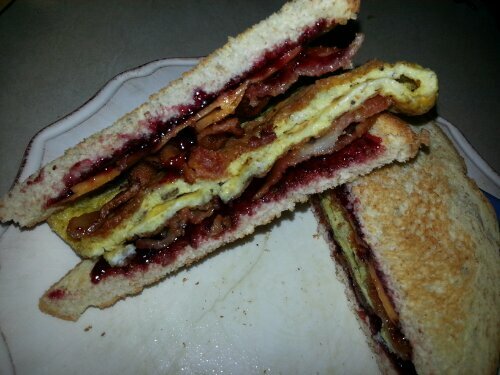 Spread toasted bread with blackberry jelly, then build the sandwich. 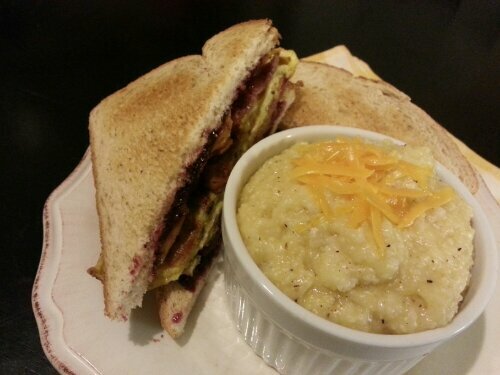 Serve with a side of cheese grits for optimum enjoyment! And remember, when building the sandwich, it’s all about good architecture! Somehow, the sandwich tastes better when cut into a triangle shape too. At least, that’s the way mama always sent me to school, with a neatly packed cut-in-half sandwich in my brown paper sack. 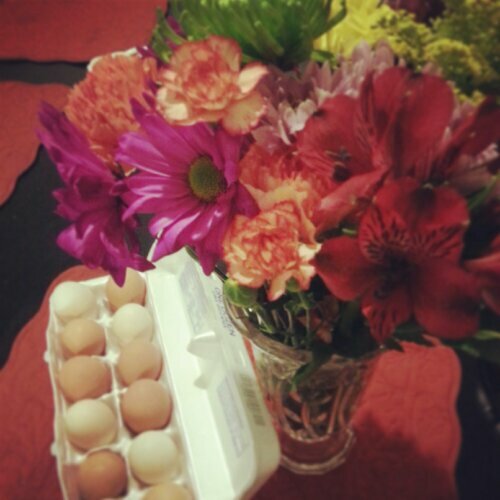 Have you ever tasted a farm egg? If so, how would you describe the difference? Not “eggstacy” lol! My grandma always cut my sandwiches diagonally too, and I just can’t eat a sandwich any other way! LOL Ritz! Glad you got my joke. I know, right? A sandwich cut down the middle, in a straight line is just not the same. Girl! You making me hungry and I know exactly what I’m bout to make!! This looks so delish. And yes, you are so right, farm fresh eggs are amazing, not too mention SO nutritious when a chicken is able to eat an omnivores diet like he is suppose to. Keep it up girl. Thank you Kristan! I appreciate you reading my post and commenting. Totally agree! Glad I could inspire your lunch, lol!